StableBit CloudDrive 1.0.2.929 BETA is now out. In addition to some bug fixes and optimizations, this release offers better compatibility with the forthcoming StableBit DrivePool BETA. When used together with StableBit DrivePool, you will be able to create all kinds of hierarchical pools, some of which can even be cloud and local hybrid pools. You will also be able to set individual folder duplication and file placement rules at each point of the pooling hierarchy. Look for the new StableBit DrivePool BETA and much more information about hierarchical pooling coming very soon. One important optimization that is new in this version of StableBit CloudDrive is native support for a minimum download size. When set, StableBit CloudDrive will try to optimize your cloud drive’s read speed by always trying its best to download at least this much data from the storage provider, regardless of how much data is actually being read from the disk. The extra data that’s not needed is stored in the local cache (with a lower priority), just in case it’s needed in the future. 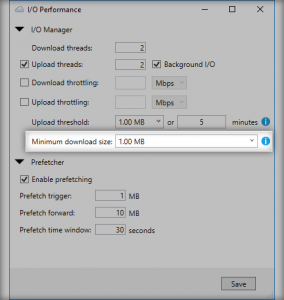 This new setting is implemented in the low level kernel disk driver itself for the best performance possible, and it also coordinates with the prefetcher to ensure that the prefetched data is using the correct block size. 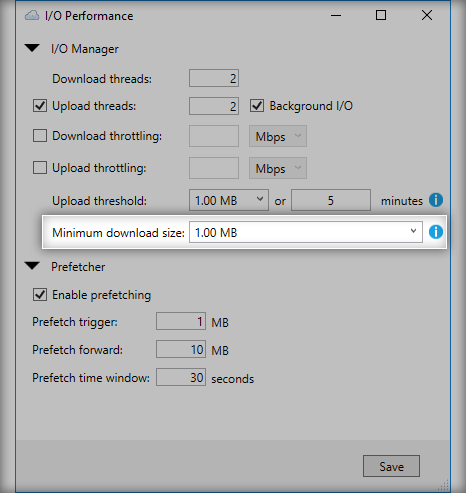 Most storage providers will now default to a 1 MB minimum download size, but you can certainly increase that or even disable it completely at any time. This entry was posted on Tuesday, September 12th, 2017 at 9:18 pm	and is filed under StableBit. You can follow any responses to this entry through the RSS 2.0 feed. You can leave a response, or trackback from your own site.